Can you love cauliflower? You bet! This once humble veggie has gained popularity as a "super food" among top chefs in recent years. We give cauliflower the gourmet treatment in these creative recipes that use cauliflower as the basis for delicious mains, side dishes and salads that are as nutritious as they are tasty. You're sure to find more than one recipe here to add to your short-list of favorite recipes that you can pull out for weeknight dinners, potluck parties, Sunday brunch and holiday meals. Roasting cauliflower brings out delicious nutty flavors in this healthy vegetable, making it a real treat to eat. This Parmesan roasted cauliflower dish is an excellent way to enjoy fresh cauliflower, even if you think you're not a vegetable lover. 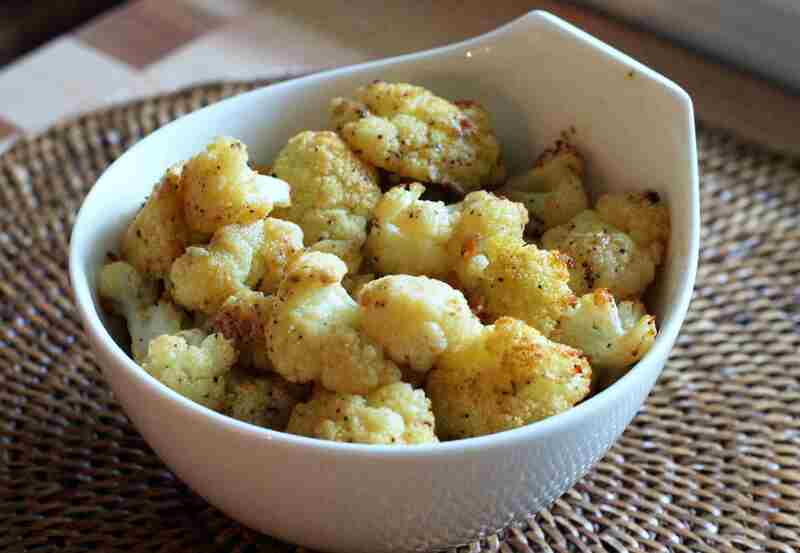 Cauliflower florets are combined with a savory mixture of garlic and Parmesan cheese, then roasted to perfection. Serve as a side dish to your favorite entree at weeknight meals or holiday dinners. Mexican food lovers, here's a simple, healthier take on tacos from the kitchens of Betty Crocker, that packs plenty of flavor while still delivering loads of good-for-you nutrition. Roasting cauliflower and chickpeas gives them a nutty, hearty taste and texture that's a fabulous substitute for the ground meat typically used in tacos. Serve it with rice, sour cream and guacamole, or just enjoy simply, for a vegetarian and vegan Mexican meal that's family friendly and easy on your wallet, too. Here's a one-pot meal recipe that's perfect for weeknight dinners, when you want to serve your family something tasty and satisfying, but don't have the time or energy to fuss around in the kitchen. Cauliflower takes the place of rice in this classic chicken casserole recipe, combining with cream, cheddar cheese, and herbs to create a hearty, low carb dinner that fills you up with plenty of flavor. When you want to come home to comfort food, this slow cooker recipe for cauliflower cheese soup is a great one to have in your repertoire. The slow cooker makes this an easy soup to prepare and cook, and it makes the perfect starter or side dish to serve with sandwiches or a hearty salad. You can add bacon or fresh herbs, for an extra perk up of flavor and texture, too. Cauliflower and Chickpea Tikka Masala is a lovely vegetarian alternative to a non-vegetarian Indian favorite meal. Creamy, rich tasting Tikka Masala sauce spiced with wonderful Indian flavors brings the vegetables to life in this family-friendly dish that's great for bringing to potluck parties, too. You can make the easy Tikka sauce beforehand and freeze to use when ready, making this a great vegetarian weeknight dinner when you're rushed for time. Do you love the barbecue taste of buffalo wings, but crave a healthier, meatless option? Vegan buffalo "wings" made of oven-roasted cauliflower smothered in your favorite hot sauce are a surprisingly satisfying way to get the taste of pub-style hot wings. Here's a great way to reduce the calories in your go-to mashed potatoes dish, while delivering all the creamy flavor and great texture you love in mashed potatoes. Low-fat buttermilk adds extra flavor and creaminess without adding a lot of calories to this dish that sneaks mashed cauliflower into the mix with cooked and salted russet potatoes. You'll be the hit of your next potluck party or picnic when you bring this delicious, creamy salad that combines crunchy, sweet and salty flavors. Fresh cauliflower and broccoli florets are tossed with cranberries, bacon, and pecans in a creamy mayonnaise dressing, for a welcome addition to any meal. Makes a great holiday side dish, too! Creamy cauliflower cheese is an essential side dish for Sunday lunch, a delicious filling for a baked potato, and makes a fabulous filling for your brunch quiches. 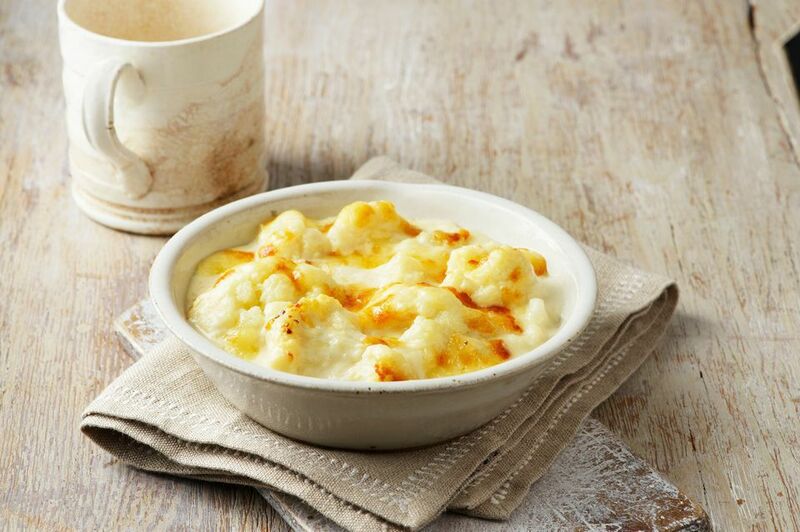 This seriously scrumptious cauliflower cheese recipe is so easy to make and a great, sneaky way to make sure your kids get their vegetables. Turn a basic head of cauliflower and some pantry staples into a delicious, warming, exotic one pot meal that's ideal for busy weeknights, or serving to guests as a vegetarian main. You could also add meat or chicken to this dish, to your tastes, but it's definitely hearty enough on its own for a comforting family meal. Cauliflower, tomatoes, chickpeas and sweet potato are simmered in vegetable stock, lightly spiced with cumin, ginger, and cinnamon, and served mounded on couscous surrounded by the fragrant sauce and sprinkled with slivered almonds or whole cashews, fresh parsley, and golden raisins. Sausage and onions are a fantastic flavor combination that rocket to the next level for family dinner when they're tossed with seasoned cauliflower and roasted to perfection. An ooey gooey melted topping of sharp Cheddar cheese finishes the dish beautifully. Assemble this easy, filling dish in about 10 minutes and pop it into the oven for a quick bake, for a weeknight dinner that's a breeze to prepare. Britain's best loved food writer, Nigel Slater, created this recipe to elevate the underrated cauliflower, and turn it into an extra special side dish you'd be proud to serve at your most important dinners. Here, the cauliflower is fried, spiced up with paprika and served with a tasty salsa verde. Makes a fabulous starter or side dish at a holiday meal or dinner with guests, or serve it as an elegant vegetarian main course. Here's a vegetarian recipe that reinvents a classic sandwich favorite and delivers loads of flavor, while offering a tasty, healthy meatless sandwich option. Inspired by the classic curried chicken salad sandwich, this recipe swaps out chicken for aromatic turmeric and delicious cumin roasted cauliflower. It's sure to become a favorite in your lunchbox, for meatless Mondays or as an everyday vegetarian entree. Creamy and rich tasting, with a crunchy topping, this casserole side dish makes a great addition to everyday family meals, and it's special enough for a holiday table or potluck. Flavorful broccoli and cauliflower bake is baked with a white sauce and a Parmesan cheese and buttery bread crumb topping. Here's a "superfood" soup that's perfect for warming your tummy on a cold winter day. Healthy, nutritious roasted cauliflower has a beautifully nutty flavor that is boosted in this recipe by fragrant turmeric powder and thickened with potato. Turmeric is an Indian spice that's beloved by people all around the world and famous for its anti-inflammatory and anti-oxidant powers. Vegan, dairy free and gluten free, this trusty, flavorful vegetable soup recipe will suit many diets and is great for beating the winter blues. Chicken curry is a comforting, warming dish to eat when it's cold outside and pub-style favorite food. This easy, inexpensive chicken curry dish is sure to become a family favorite and is so tasty you'll be proud to serve it to visiting guests, too. Chicken thighs and fresh cauliflower florets combine with canned tomatoes, brown sugar, coconut milk, and Indian spices to create an aromatic, delicious dish that's ideal for weeknight meals or Sunday dinners. Whole Roasted Cauliflower "Butter Chicken-Style"
Butter chicken is the superstar of Indian foods and the one that Americans love to eat. Here's a genius vegetarian dinner recipe that serves up a whole head of cauliflower "butter chicken"-style, giving you all the intense, spicy flavors of that favorite Indian meal, in a delicious meat-free main. You'll love this unique way to cook a whole head of cauliflower and you'll win big points with friends and family for the fabulous flavors that result. Want to change up your usual side dish game? These great-tasting cheddar and cauliflower cakes are a delicious alternative to meat or potatoes as a side dish for weeknight dinners. You can also add these low carb, gluten free patties to salads for your brown bag lunches or a nutritious school lunch for kids. Planning an outdoor party? Here's a great vegetable dish you can make on the barbecue that's a lot more special than the usual grilled veggies. Nutty, great-tasting grilled cauliflower spends less than ten minutes on the grill and is topped with a creamy, delicious sesame aioli. Quick and easy, this is sure to become one of your favorite ways of preparing cauliflower. What's not to like about this delicious, creamy, cheesy vegetable soup? Two favorite veggies are combined in this smooth, pureed soup that's perfect for cold winter nights, but can be enjoyed year round. Cauliflower and broccoli are flavored with mustard, cheese, and a little crème fraiche and topped with crunchy croutons, to create a filling nutritious soup that makes a great, simple main course, poured into a hot dish with crusty bread on the side. Or serve it in smaller portions as an elegant starter or appetizer. Brunch just got more nutritious with this "impossible" vegetable pie recipe. So easy it's hard to believe that this yummy dish is more like a crustless quiche than a pie with a crust. The combination of flavors makes for a delicious lunch or brunch pie that's vegetarian friendly. You can add some bacon, ham or browned sausage as you like, to make it a heartier dish.